"To pray unceasingly" is a command given to Christians by Paul in Thessalonians. What does it mean to pray without ceasing, especially in today's busy world of rapid change and the stress that accompanies it? Debra Farrington explains that praying constantly "is as simple, and as difficult, as recalling God's presence often throughout the day, by connecting Scripture and daily activities." 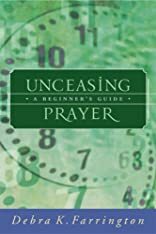 Her new book, Unceasing Prayer: A Beginner's Guide,, provides concrete ways that readers can begin to practice unceasing prayer. The book is broken down into two parts: the first suggests prayers for specific times and activities of the day, and the second provides prayers for times of need and times of celebration. Through practical, realistic examples, Farrington demonstrates how to make all action, or inaction, a time of prayer. The simple act of dressing can allow us to ask the Lord to be clothed "with compassion, kindness, humility, meekness, and patience" (Colossians 3:12). A commute to work can offer an opportunity to ask God's guidance and direction. Unceasing Prayer is ideal for all those whose schedules are not conducive to formal prayer. College students, parents of young children, caregivers, and those who are ill, will benefit from this new approach to daily prayer. All individuals engaged in a prayer life, both beginners and those who are more experienced, will find new meaning and renewed vision in this little guide. About Debra K. Farrington (Author) : Debra K. Farrington is a published author. A published credit of Debra K. Farrington is Unceasing Prayer: A Beginner's Guide.